What does the word “epistle” mean? 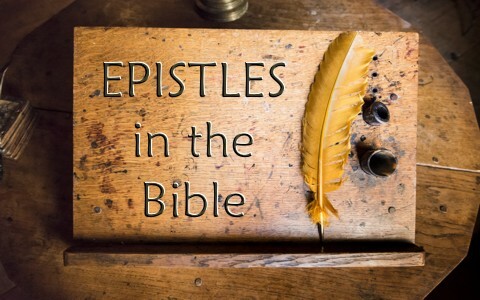 What were the “epistles” anyway and why is the word no longer in use today? I read a survey many years ago that tested the biblical literacy of Christians. One of the questions was “What were the wives of the apostles called?” There were multiple choice answers and the one answer that received the most votes was the apostles wives were called “epistles” but that is, of course, wrong so let’s find out the answers to the questions: what were the epistles in the Bible and what does the word epistle mean? The word “epistle” is from the Greek word “epistolē” and is a derivative of “to send a message” (to “epi” send “sellein”) of which the roots are based in the Indo-European language so it shouldn’t surprise us that the letters sent from the Apostles are called “epistles,” in most translations. By the way, not all of the books of the Bible, including those in the New Testament, are epistles as we shall see. An epistle is a long, formal, didactic or teaching letter. For example, the gospels are not classified or called epistles or letters even though they were circulated among the churches but neither is the Book of Revelation regarded as an epistle. The so-called prison epistles were those that Paul sent to the Ephesians, Philippians, Colossians, and Philemon, a slave owner, which he composed while in prison. These were letters sent by Paul to send messages to these churches because he couldn’t visit them. It’s important to know that not every book in the New Testament is an epistle but all of Paul’s letters or epistles were called epistles including the so-called “pastoral epistles” sent to Titus and Timothy (1st and 2nd). Bible scholars are not sure about who the author of the Book of Hebrews was. Some scholars believe it was Paul but there is no absolute overwhelming evidence of this. Some believe it is a compilation of various author’s work like Barnabas, Paul, Apollos and others but I suspect it was Paul who wrote it if I was forced to make an educated guess. I have already mentioned James, Jude, Peter, and John’s epistles being sent specifically to Christians, whether they were those dispersed among the Roman Empire or those still living in Jerusalem. This list, including those of Jude, Peter, James, and John’s are all epistles, as well as Paul’s. So now you know what an epistle is and which books were epistles, and that they were basically letters sent from the apostles (Peter, Paul, and John) or church leaders like Jude and James. These were sent to be read to specific cities or regions and sometimes letters sent (epistles) to specific cities or regions. There are more authors than Paul who wrote epistles. These include the three books of John (1st, 2nd and 3rd John), Jude, James, and Peter (1st and 2nd). These are letters or epistles that are messages sent in written form like a letter with the intent of teaching the local churches or the Christians that have been dispersed. Peter sends his 1st letter or epistle to the scattered Jewish and some Gentile Christian “exiles of the Dispersion in Pontus, Galatia, Cappadocia, Asia, and Bithynia in Asia” (1 Pet 1:10). James wrote “To the twelve tribes in the Dispersion” (James 1:1) which means the tribes of Israel or the Jewish Christians that had likely been scattered around or dispersed into the far reaches of the Roman Empire by the severe persecution that came to Jerusalem and to the city of Rome. Both James, Jude, and Peter sent these letters (epistles) to be read by all churches everywhere but like Paul’s epistles, they never wrote them to shame the churches (1 Cor 4:14) but in order that the churches would hold onto the teachings that were passed on to the church leaders that they had received from Christ (1 Cor 11:2). This is what is called the “apostolic teachings” which still have application today. That’s the whole idea of the letters or epistles. They are instructive teachings for the churches both in Judea and those Christians that were scattered about all the regions of the Roman Empire and which are every bit as relevant for believers today. We don’t use the word “epistle” anymore in our language. We just say a “letter” but it’s essentially the same thing. I hope this completely clears up any question you might have had about what epistles are, what the word epistle means, who wrote the epistles, and what prison and Pastoral Epistles are. There is so much to learn from these epistles that apply to the Christian today. Some of these teachings will always be applicable to the believer and even those who haven’t yet been born again (John3:3) or even physically born yet. No wonder the Word of God hasn’t changed in these past two thousand years or so; you can’t improve upon perfection and the Word of God, from the Old Testament to the New, is perfect in every way and able to restore the damaged human heart (Psalm 19:7) and bring eternal life to all who believe in this Word (John 15:1-5). Thank you for continuing to educate us. I often feel that the use of outdated language is an unnecessary barrier. Tradition is important to some people, but I feel a greater importance should be placed on helping people to understand the Holy Bible with as few language barriers as possible. I used to read the King James Version, but now that I look back, I see how much of a hindrance the outdated language was for me. Thankfully we have you to help clear the fog. I have searched for a good Holy Bible dictionary, but have not found one that I like yet. Jim, you are always the encourager sir. I would recommend anyone reading this to click on your name for your rock-solid website, “Growing Faith” or click on this link: http://growing-faith.org/ because I know Jim and brother, you are such a humble man I, having feet of clay, must give all glory to God for what do I have or what I have learned but not from God. Thank you anyway sir. May God richly bless you. Well said brother…knowing you as I do now, you live this out my friend. Helping others to understand God’s word is what we are called to do, “Make Disciples”, to lead those to the Cross. We have been giving these vital tools ( gifts ) for the edification of the body of Christ, to edify and to build up.